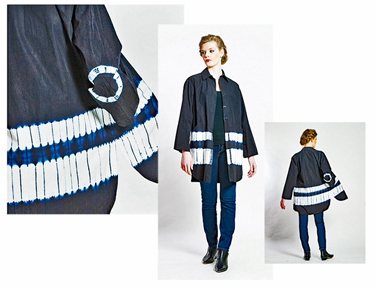 Mary has studied at the University of Notre Dame, the University of Wisconsin-Madison, the Fashion Institute of Technology, and Nihon Senshoku Gakuen, Kyoto, Japan, where she worked on couture collections with kimono artisans at Shiho International (Kyoto; Paris) and Koei Kogei Kinsai Yuzen Dyeing. She has also designed for Mary McFadden and Jack Mulqueen. Mary is the recipient of several awards and honors, including the Association of Total Fashion Upcoming Designer Award (Osaka, Japan, 1988) and is a BUILD 2008 Special Honoree. 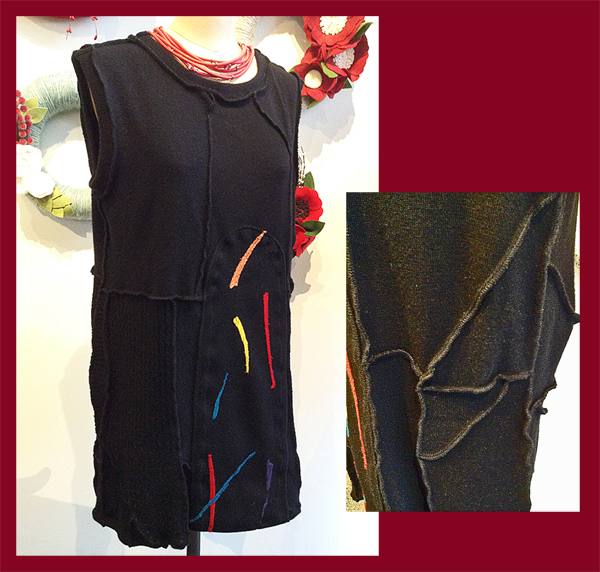 Her work is featured in The Fiber Arts Book of Wearable Art by Katherine Duncan Aimone. 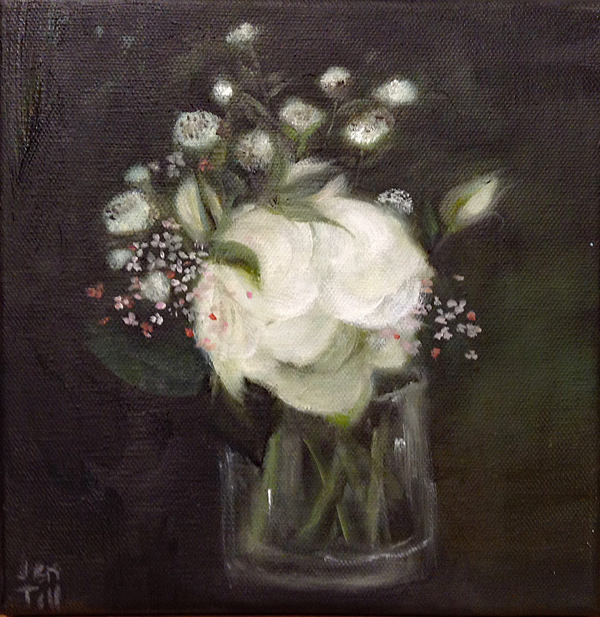 She has exhibited internationally and her work has been featured in publications including FiberArts, Surface Design, Food and Wine, New York Magazine, Oprah, Brides, Interior Design, Elle Décor, Weekend, McCalls, and Martha Stewart. She is currently based in New York City. INFORMATION COMING SOON or contact the Gallery. 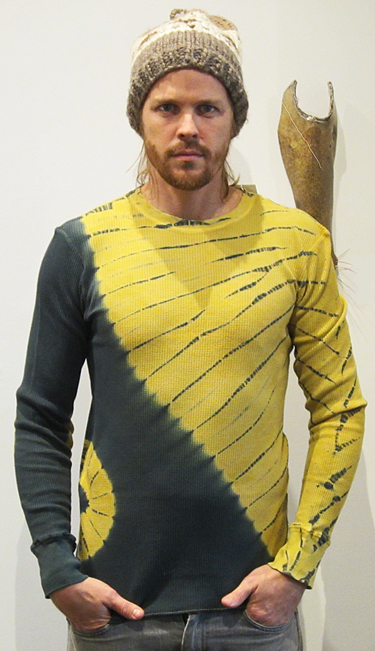 For the man in your life: Mary Jaeger's extremely cool Men's Collection Engineered Tees: Forest green/sweet mustard Waffle Weave Tee, all cotton, long sleeves, crew neckline; one-of-a-kind. 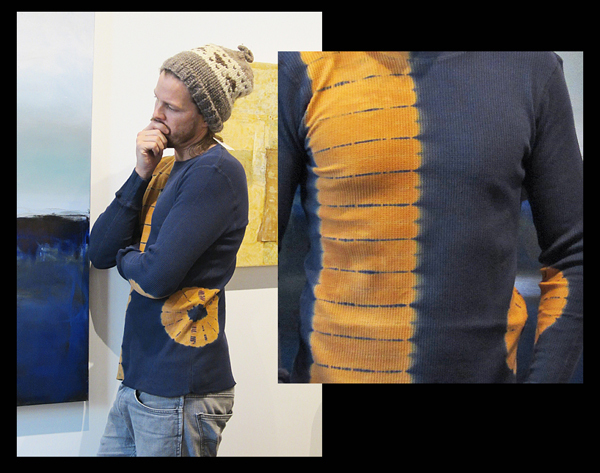 Size L.
For the man in your life: Mary Jaeger's extremely cool Men's Collection Engineered Tees: Indigo/honey Waffle Weave Tee, all cotton, long sleeves, crew neckline; one-of-a-kind. 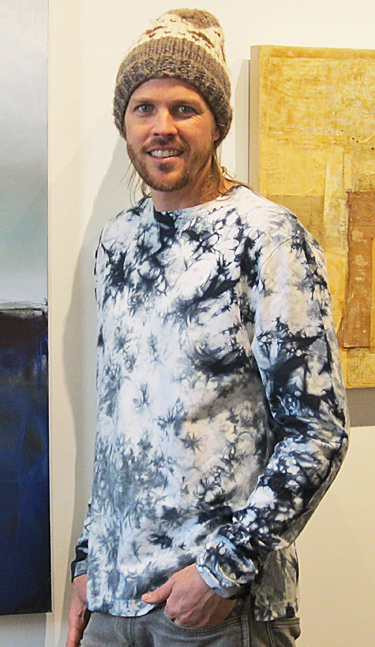 Size L.
For the man in your life: Mary Jaeger's extremely cool Men's Collection Engineered Tees: Black/white Wave Tee, cotton/lycra, long sleeves, crew neckline; one-of-a-kind. 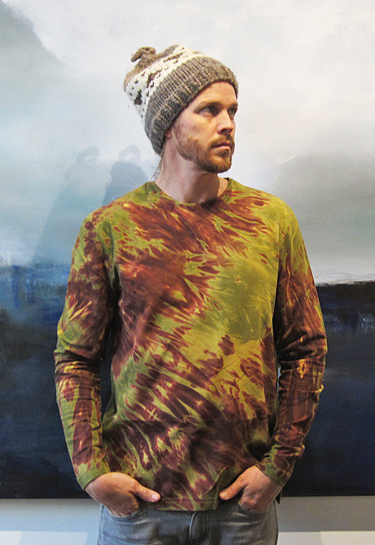 Size L.
For the man in your life: Mary Jaeger's extremely cool Men's Collection Engineered Tees: Indigo/brown Wave Tee, cotton/lycra, long sleeves, crew neckline; one-of-a-kind. Size L.
Mary Jaeger's extremely cool Men's Collection Engineered Tees: Khaki/brown Wave Tee, cotton/lycra, long sleeves, crew neckline; one-of-a-kind. 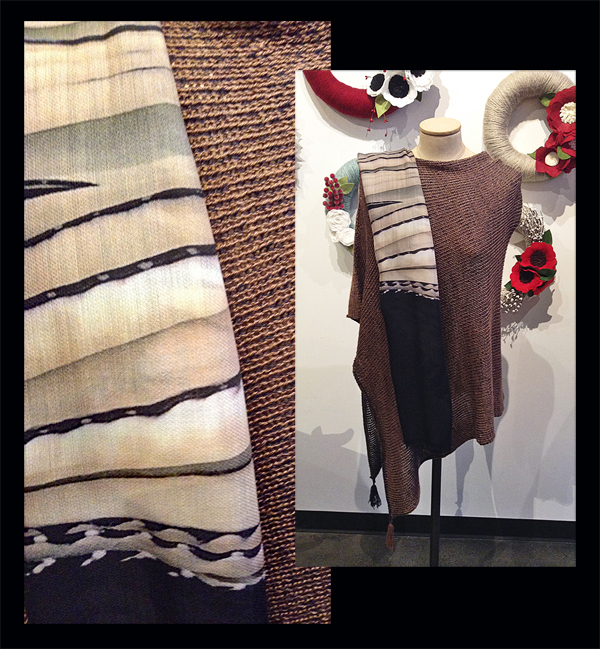 Size L.
A long, dreamy-soft wool scarf in black and white. in Mary's Optical Loop series. One-of-a-kind. From the Unfolding Project: Tiger. 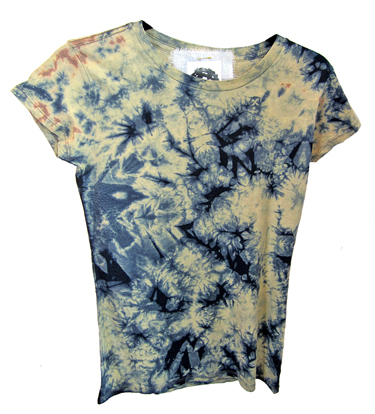 Silk chiffon. Dimensions: 78" long x 25" wide. 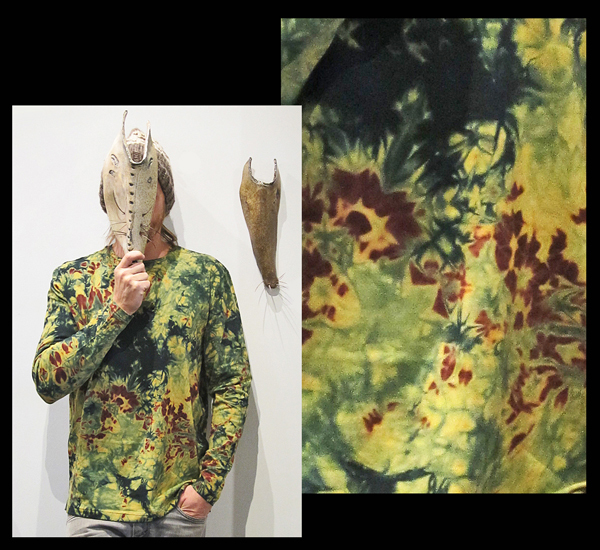 Unfolding Project: Wrapped shirt. 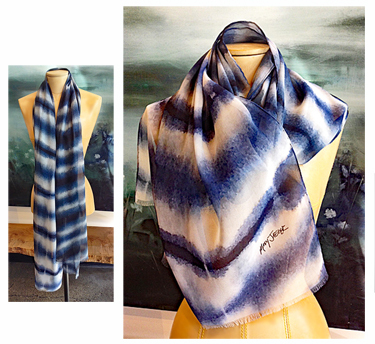 Challis, 65% wool/35% silk. 26" x 80", natural edge. Dry clean. 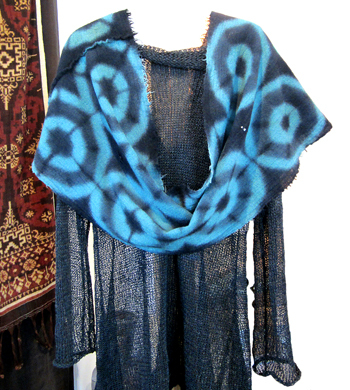 A stunning looped scarf, it is wool, shibori hand-dyed and stitched with black crystals. Teal, black. Dimensions: 15" wide x 72" around.